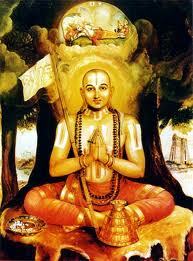 In this Part we will explore the meaning of the Fifth Dhyana Shloka. 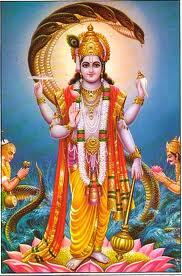 The essence of this Dhyana Shloka is ‘Vishnum Namaami’ – ‘I salute Lord Vishnu’. How do I salute Him? Shirasaa Namaami – I salute him with my head bowed. The head is the most important of all the body parts. It contains four of the five sense organs namely eyes, ears, nose and the mouth. Even the fifth sense organ that is skin is also present in the head. The head also contains two of the important Kundalini energy centres namely the Aajna chakra and the Sahasrara chakra. 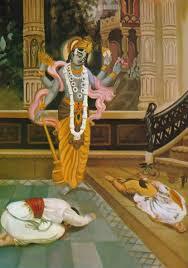 So, by saluting Lord Vishnu with the head, the devotee effectively surrenders his whole self to Him. The rest of the words in the Shloka extol the Lords attributes and HIS divine splendour. SashankhaChakram – Carrying a conch (Shankha) in one hand and a discus (chakra) in the other. His Shankha is called ’Paanchajanya’, the vibrant, sonorous sound of which inspires valour, courage, gusto and inner spirit. 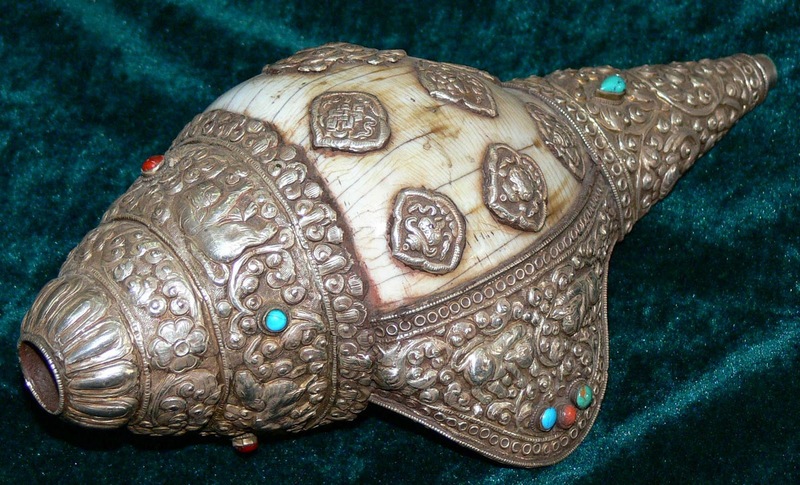 Though not directly a weapon, the Shankha is used in battle to create a sound which strikes terror in the heart of the enemy. It acts as a psychological weapon by instilling fear in the enemies mind and heart. Also in a wider perspective, when the conch is blown with controlled breath, the primordial sound of “Om” (Pranavam) emanates from it. This eternal sound is the origin of all Vedas and the Universe itself. The Chakra is called ‘Sudarshana Chakra’. The word Sudarshana is derived from two Sanskrit words – Su (सु) meaning “divine” and Darshana (दर्शन) meaning “vision”. Hence, the word Sudarshana collectively means “vision of which is auspicious”. 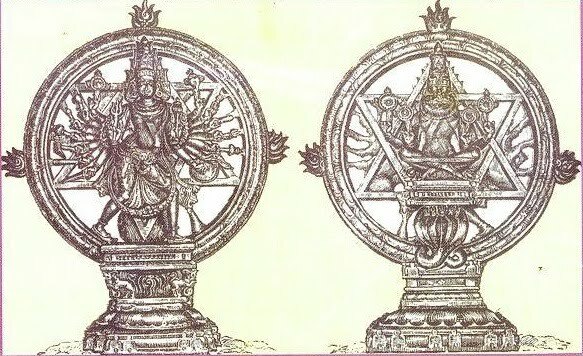 The Sudarshana Chakra was made by the architect of gods, Vishvakarma. Lord Sudarshana is generally worshiped during Homas to ward off negative powers or vibrations. The word chakra is derived from the word Chruhu (चृ:) meaning movement and kruhu(कृ:) meaning to do. Hence, Chakra collectively means the one which is mobile. Among all the Vedic weapons, Sudarshana Chakra is the only mobile weapon as it’s always spinning. It’s a unique weapon in the armoury of Lord Vishnu, a super weapon with 108 serrated edges, much like the modern heat seeking cruise missile except that Sudharsana Chakra safely returns back to Him. The Chakra is constantly spinning and returns to his index finger after the target is vanquished. The use of the Sudarshana Chakra is occasionally mentioned in the Rigveda, Yajurveda and Puranas, as an ultimate weapon of law, order and preservation to eliminate the enemy. In the South, the Sudarshana Chakra is also known as Chakkrath Azhwar. There are a few illustrations where the Chakra has been used by the Lord. It’s described in the Srimad Bhagavatam that when Lord Krishna lifted the Govardhana Giri (Hill) to save the residents from torrential rains caused by the wrath of Indra, HE held the discus under the base of the hill for support, thus humbled Indra’s thunderbolt. Lord Krishna also used the Chakra to slay Shishupala. 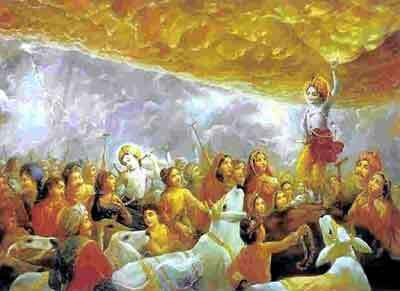 In the Mahabharata, it was used to create an artificial sunset so that Jayadratha could be annihilated. But the best example of Lord using Sudharshana Chakra to save his ardent devotee is when He used it against Sage Durvasa, who was known for his impatience and anger. 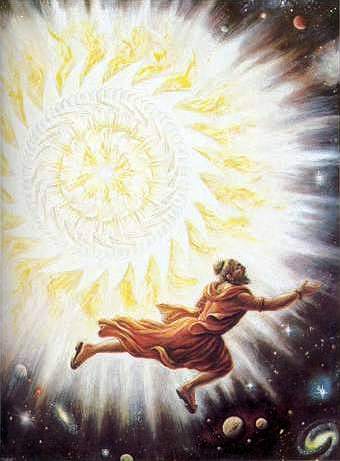 When Sage Durvasa needlessly cursed one of Lord’s beloved devotees King Ambarish, the Lord released His Sudharsana Charkra (discus) onto the Sage and it chased him to the end of the world. Finally, the exasperated Sage approached Lord Vishnu to seek his forgiveness and the Lord promptly asked Him to seek the King’s forgiveness. When the Sage complied with that, the Lord withdrew His discus. Meaning: His discus is endowed with one thousand sharp cutting edges and it emanates a dazzling brilliance and scorching heat. 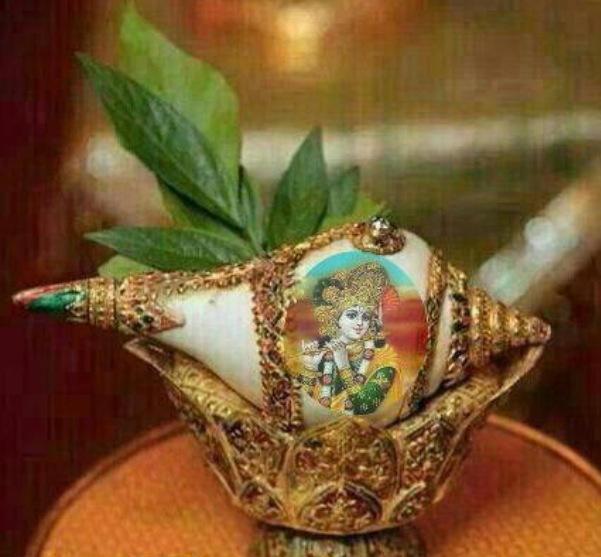 His Shankha is compared to a white royal swan situated in the lotus of his hand. SakireetaKundalam – Carrying a beautiful crown on his head and wearing resplendent rings dangling from his ears. SapeetaVastram – Wearing a beautiful yellow silk attire. This is the same as PeetaKowsheyaVaasam which we saw in Dhyana Shloka 4. He is constantly referred to as the Peetaambaradhaari. He is fond of adorning Himself in the finest possible attires made from the highest quality fabric. In Srimad Bhagavatam, Sage Kapila says ‘lasat-pankaja-kinjalka-peeta-kowsheya-vaasasam’ His silk Peetaambaram is shiny yellow like the filaments of a Lotus. While Lord Shiva is known as an ‘Abhisheka Priyar’, Lord Vishnu is known as an ‘Alangara Priyar’. Saraseeruhekshanam – Saraseeruha is a Lotus because it grows in Saras which is a pond or a pool of water. 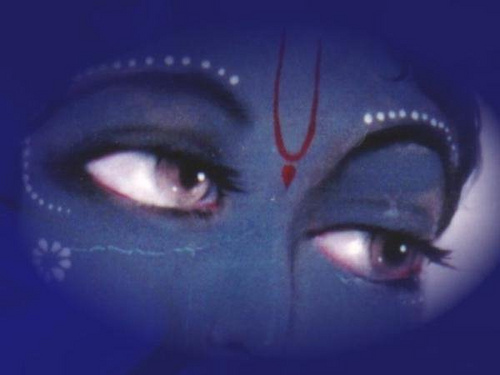 Eekshana means the eye and the Lord’s eyes are beautiful like the Lotus flower. We have seen similar admiration of the Lord in earlier Shlokas with descriptions like ‘KamalaNayanam’ and ‘Pundareekaayataaksham’. Poets love to expand on this theme. Maharaja Swathi Thirunal’s composition of the melodious song ‘Paripaalaya SaraseeruhaLochana Bhavabhaya kaanana bhanjana’ in Pantuvaraali expounds on this beautifully. SahaaraVakshasthalaShobhiKoustubham – Sahaara means with a garland or a necklace, Vakshasthala is chest, Shobhi means shining and Kousthubham is the magnificent gem. He is wearing a garland which adds to the splendour of the glittering Koustubham gem. The garland worn by Lord Vishnu is known as Vanamala or VaijayantiMala composed of fresh flowers from the forest. The Haara referred here could also be the necklace made of precious jewels. In some versions of the Sahasranamam, this word has been replaced by SahaaraVakshasthalaKoustubhaShriyam. In this version the presence of Goddess Lakshmi Devi on His chest is emphasised. Chaturbhujam – Chatur is four and Bhujam is hand, describing Lord Vishnu’s four hands. These images are also depicted in the following verses we use in our daily Sandhyaa Vandanam which incidentally includes complete surrender to the Lord i.e. Saranagati. This was also the prayer recited by Draupadi to call on Lord Krishna when she faced her moment of distress. – Who is carrying a conch (Paanchajanya Sankha) in one hand and a discus (Sudharsana Chakra) in the other. – Who has four hands. This is very nice and very detailed. Is there earlier Sub-stanza missing in this ? Pls. also add the meaning of these. Pls. email me or advise your email address. Thank you. I will add this Stanza. This verse is not in all the versions of Sahasranamam. I will add it to the same Shloka over the next few days and will let you know. God bless you! Hari Om!!! Dear Sir, Thank you very much ! Thank you Vinu ji 🙂 HARI OM!!! God bless you!!! A beautiful exposition! Waiting eagerly for your future posts!